Delve into the scenic delights of New Zealand with a small group of explorers. 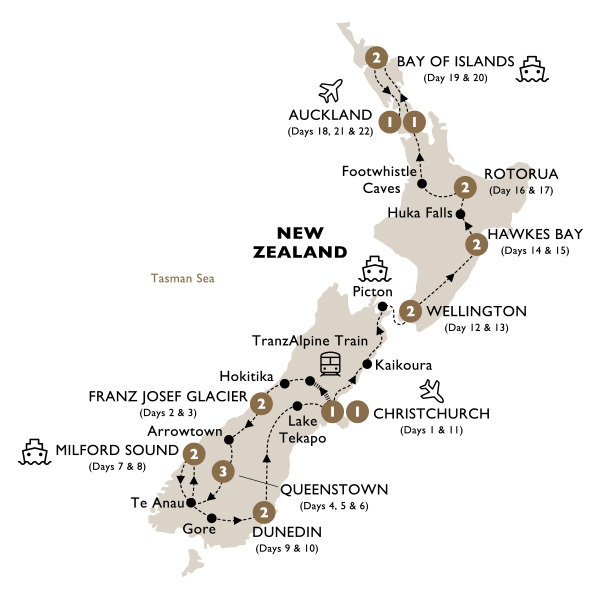 Combine natural beauty with creature comforts as you stay in the rainforests of Franz Josef at the foothills of Mitre Peak in the Fiordland National Park, immerse yourself in to the era of art deco in Napier and journey into the deep south to the highland country of Dunedin. Experience the country in the best possible way - discover Milford Sound by sea kayak, explore the magical Glowworm Grotto and gain an insight in Māori culture with a unique Māori Hāngi dinner and concert in Rotorua. Day 12 - Christchurch to Wellington. Day 13 - Wellington Your Way. Day 14 - Wellington to Hawke's Bay. Day 15 - Exploring Napier. Day 16 - Geothermal Rotorua. Day 17 - The Sights of Rotorua. Day 18 - Footwhistle Cave and Auckland. Day 19 - Auckland to Bay of Islands. Day 20 - Bay of Islands at Your Leisure. Day 21 - Cruise the Bay of Islands and onto Auckland. Day 22 - Farewell Auckland. Dining Summary: 21 Breakfasts (B), 1 Lunch (L) and 13 Dinners with Wine (DW).